The risk of developing an addiction to gambling is a common concern with many players around the world, especially when playing top video slots. Rightfully so in our opinion as it can be damaging, however, we wanted to find out the truth about so called ‘problem gambling’ in England. Here at Easy Slots we collected research and data findings from the Gambling Commissions Report of Statistics of 2016. Highly reliable data which you can count on for having a high degree of validity. The statistics found that from the total population of England around 56% of people gambled, a very significant number, at over half. When we exclude those who had gambled solely on the National Lottery draws the figure was at 42% so again very high. In contrast, the figures for problem gamblers were very low, only 0.7% of people in England would identify themselves as a problem gambler and only 1.2% of the actual gamblers in England identify as problem gamblers. Suggesting that since these two sets of figures are so comparatively different, the problem may not be as big as society leads us to believe. However, we should still try our best to reduce this number even further as problem gambling is certainly not a positive thing at any degree. Additionally, the report found 3.6% of people in England were at low to moderate risk of developing problems with gambling. With also 6.6% of actual gamblers at a low to moderate risk too. Again, figures which could be improved on, but shows the vast majority of players are able to maintain gambling as purely a hobby. 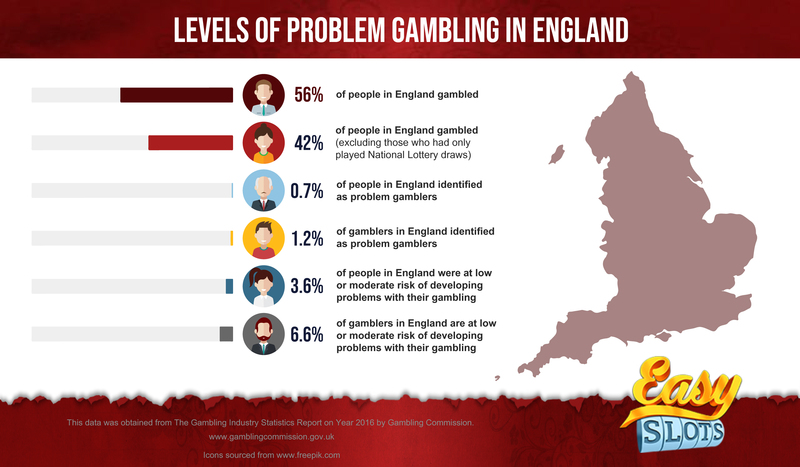 All in all, this Info graphic and report has proven gambling is an extremely popular past time, with over half of England being active participants. With relatively small figures for actual problem gambling. Although we should always try our best to promote responsible gambling in the industry to ensure these figures continue to decrease.